In response to my op-ed “Tibet and China at the same Washington Lobbyist” published July 10, 2015, Mr. Kaydor Aukatsang, Office of Tibet representative, has written to The Washington Times on August 3, 2015, claiming that I made “false allegations.” Mr. Aukatsang has not shown any facts in my op-ed to be false; he merely offers differing opinions or attempted explanations. As my father Senator Daniel Patrick Moynihan said, everyone is entitled to their own opinions but not their own facts. 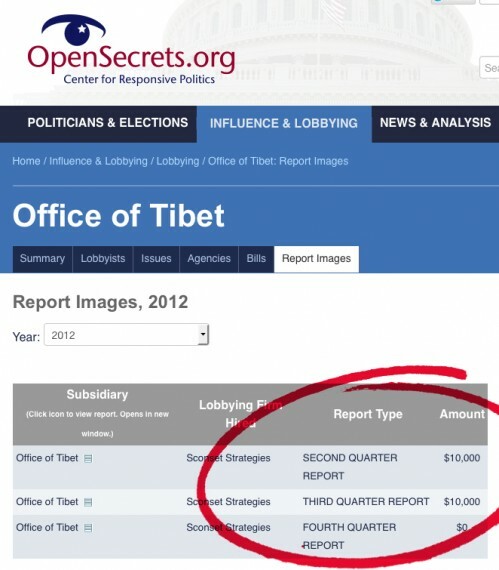 Mr. Aukatsang writes that the lobbying firm Sconset Strategies’ scope of work for the Office of Tibet was “limited to facilitating a couple of meetings on Capitol Hill in July 2011 and this service was provided pro-bono.” Both of these claims are inaccurate, according to documents from the U.S. Senate and the Center for Responsive Politics. Far from being limited to “a couple of meetings”, Sconset’s work for the Office of Tibet spanned advocacy on “[f]oreign Aid, self immolations, immigration policy.” And rather than being pro bono, the Office of Tibet appears to have paid Sconset at least USD 20,000. Mr. Aukatsang’s easily disprovable statements on Sconset can only call into question his credibility on other matters as well. The Office of Tibet’s decision to hire Sconset demonstrates questionable judgment: Washington is filled with lobbyists; why did the Office of Tibet choose a firm whose main client is an avowed Chinese nationalist investigated by the FBI? Allowing this conflict of interest indicates either incompetence or worse. Regarding Lobsang Sangay’s 2005 trip to China, Mr. Aukatsang evades the point. It is not about the trip but rather Mr. Sangay’s attempt to hide the Chinese papers he used to go. After long denying that he had used Overseas Chinese National papers to go to China, Sangay finally admitted it in 2011. In a fractious discussion in the Tibetan Parliament-in-Exile on March 22, 2014, Sangay admitted to going to China but again evaded the issue of signing Overseas Chinese National papers. Here is the video (at the one hour mark, in Tibetan). Mr. Aukatsang is also dodging the mortgage issue, as Mr. Sangay did in the Tibetan parliament session in 2014. Both individuals misleadingly equate buying a house with paying off the loan, which takes most people 30 years to do in the US. For Sangay, just four years after buying a house near Boston, he managed to pay off a USD 227,000 mortgage on July 29, 2011; he became prime minister just one week later. He originally took out a normal 30-year mortgage well before he was a candidate, and suddenly he found the funds to pay it off on the eve of inauguration. Sangay still refuses to account for how his quarter-million-dollar debt disappeared overnight, and with such fortuitous timing. Mr. Aukatsang also does not address Sangay’s disturbing use of Chinese Communist propaganda code-words in his published papers, wherein Sangay refers to pre-1959 Tibet as a “feudal realm” that was “shackled to feudalism,” with “monks and grandees” displaying “reactionary” anti-modern attitudes. This is language that originates from Chinese Communist propaganda tracts about Tibet. Sangay also – fifteen times – calls His Holiness the Dalai Lama simply “the lama,” a level of disrespect that only Chinese Communists employ. Here is the paper, “Tibet: Exiles’ Journey” (2003), in Journal of Democracy. As for Mr. Aukatsang’s attempt to portray Mr. Sangay’s embrace of Chinese Communist rule in Tibet as much ado about nothing, this is like the attempt to evade the Office of Tibet’s relationship with Sconset Strategies in the face of facts showing otherwise. The simple fact is, when the Memorandum and Note were issued under Sangay’s predecessor, the “Middle Way” position on autonomy did not mean embracing Chinese Communist rule of Tibet, rejecting democracy, and allowing unlimited Chinese militarization of the plateau. When Sangay talks about his new policies toward China, he is no longer describing what was once understood as the Middle Way. The question is why.